I remember the first winter I had goats. I had read about how hardy goats were and that they didn't need much for winter protection. So, when I saw the weather was supposed to drop below freezing, I put some extra straw on the goat barn floor and went back to the house to get warm. The next morning, I walked into the goat barn and found all of my goats piled together in a heap. Shivering! The wind was cutting through their barn like a knife, and I had to go back to the house to put on a heavier coat to milk my girls. While I was inside, I filled up a couple of buckets of hot water and brought them back for my does. They lapped up that steaming water like they were dying of dehydration. As the water warmed them from the inside, their shivering slowed. This experience was a huge lesson for me. As I witnessed my goats' discomfort, I realized that the kind of winter protection livestock need is specific to your location, your goats, and your infrastructure. Maybe goats with angora coats or those bred for Alpine conditions don't need winter protection. But in my barn, with our winds, temperatures that dip as low as 5°F, and our breed (Nigerian Dwarfs), my goats need winter protection! Shivering goats is a surefire sign to me that goats are stressed. 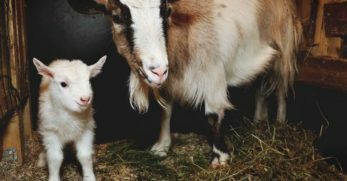 As a goat keeper, one of my main goals is to minimize stress for my goats so they can be healthy, happy, and productive on my homestead. So, after that experience, I now have a system for winterizing my goats and their barn to keep them comfortable in the cold. Our summer tends to extend through fall; then winter shows up without warning. As a result, my goats don't always have their heavy winter coats grown in when the real cold hits. Around mid-fall, I start feeding my girls a bit of extra hay and pelleted feed to help them put on a little fat going into winter. It helps get them in condition for breeding. Plus, this gives them a layer of fat to keep them warm during the cold. They can also draw on those body fat stores to quickly grow in their winter coats when their bodies finally register the necessity of doing so. 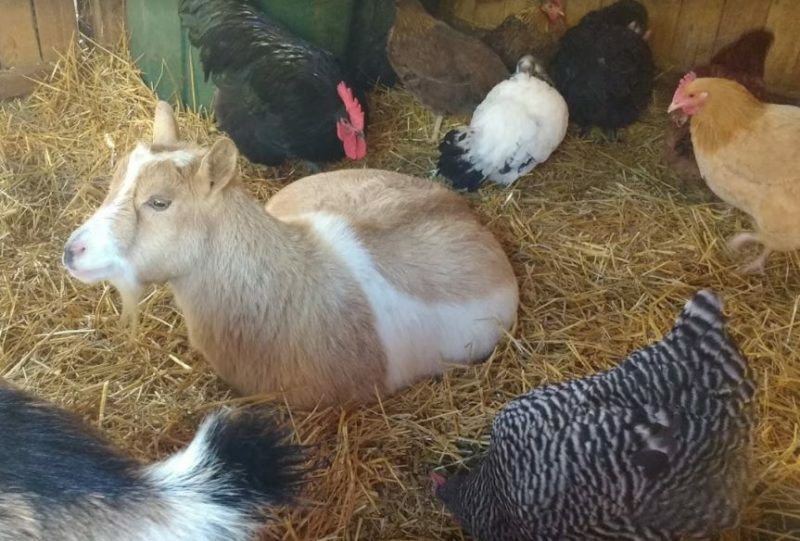 Now, you don't want your goats to be obese! You only want a little extra layer of meatiness around the middle and along the spine to soften the transition to the colder weather. If your goats start to balloon, reduce your supplemental feed quantities to maintenance levels. 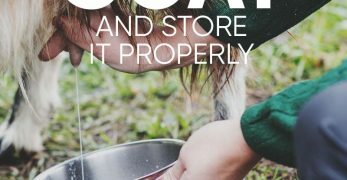 If you use a salt block in the summer, switching to loose minerals in winter is a good idea. 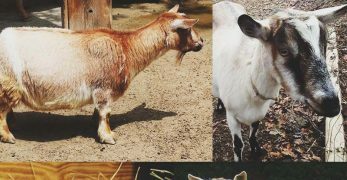 Particularly for mini-breeds, it's difficult for goats to get all the minerals they need from licking a salt block. Loose minerals are more accessible. 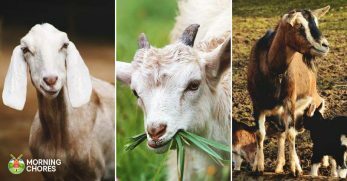 In winter, as good forage declines, access to supplemental minerals becomes extremely important to goat health. Those minerals are also necessary so goats can put on their healthy winter coats to stay warmer in the cold weather. Copper, in particular, is essential for the production and maintenance of a dense winter coat. Cobalt, phosphorus, iodine, selenium, and zinc may also play a role in a healthy coat. Protein is another essential ingredient in healthy coat production. Sufficient protein also enhances your goat's abilities to stay warm in winter. Grass hay alone, may not have sufficient protein to keep goats warm in the winter. Adding in legume hay such as alfalfa, lespedeza, and clover can increase protein. Or, adding alfalfa pellets, if good legume hay is not available in your area, can help. Supplementing with a pelleted goat feed with 16-17% protein can also help manage protein levels for good winter body condition. 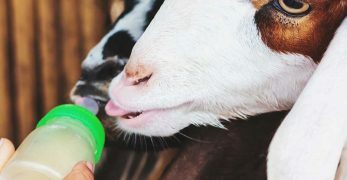 Note: Male goats don't need as much calcium as female goats in milk production or preparing to lactate. 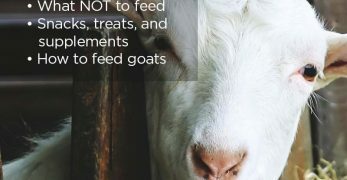 So, be careful not to overload your male goats with alfalfa or any other high calcium protein supplement. Too much calcium can increase the risk of urinary calculi, a potentially lethal condition. 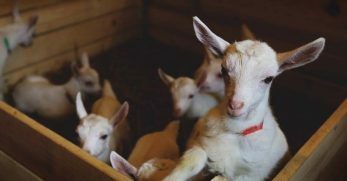 At all times of the year, good air circulation in your barn or goat shelter is critical to goat health. In winter, over-insulating can lead to accumulations of ammonia and excess moisture that can contribute to goat pneumonia. The trick with winterizing your goat shelter is to find the balance between warmth, while still maintaining proper airflow. 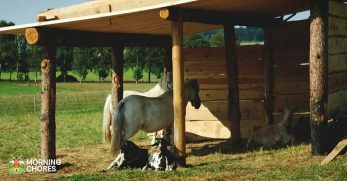 Rather than insulating your entire shelter, focus on reinforcing areas where your prevailing winds blow. Ours come from the North. So, by putting up a sheet of plywood or applying insulation to our north side walls, we cut down on cold drafts blowing over our goats. By leaving our other areas open to good airflow, we still allow fumes and moisture (e.g., from goat breath) to escape. If our winds shift and our goats need a bit more protection on other sides of their barn, I hang tarps over the windward walls to provide temporary protection. Then, I remove the tarps once the wind shifts again. It would cost me way too much money (and effort) to try to winterize my entire goat barn. Instead, I focus on creating comfortable spaces for goats to sleep and lounge in cold weather. 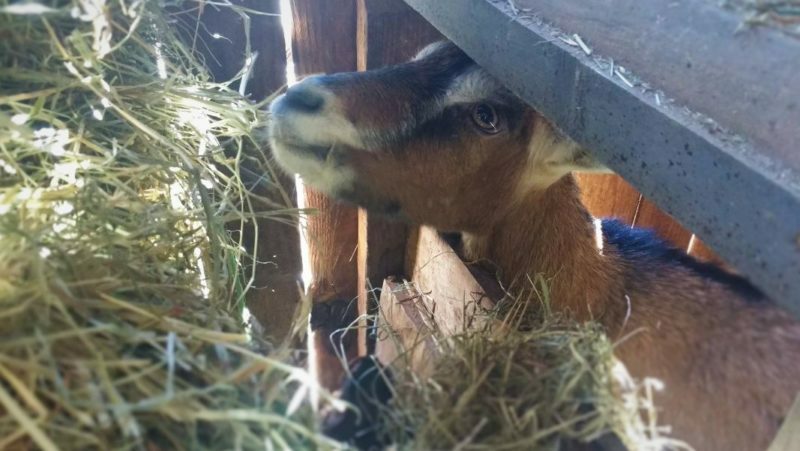 Because my goat barn is small and I need it to use the space for milking, kidding, and more, I use temporary methods to create these comfort zones for my goats, rather than building anything permanent. Throughout the year, I fill large-sized trash cans with goat litter and manure to allow it time to compost. In fall, though, I bring in a few extra trash cans and fill them to the brim with composting materials. Then I use those filled trash cans to define my comfort zones. The cans make a sort of temporary partition, or wall, to limit the wind flow coming through the doorway to the goat shelter. 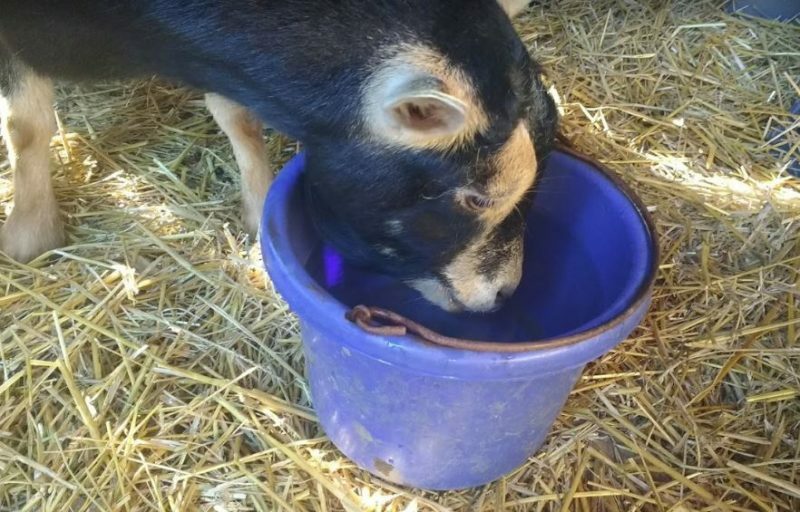 They also generate a little heat as they are composting and act almost like earthen walls to absorb heat in the day and release it into the barn at night. I also store stacks of hay and drums of pelleted feed along my north wall, where our cold winds come from, to further insulate against wind chill. 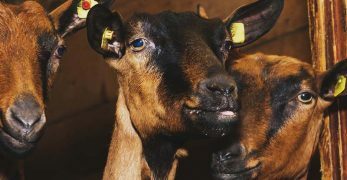 Another simple way to increase the warmth for your herd is to limit the area in their goat shelter during cold periods. My little goat barn has two rooms. In summer, I give goats access to both rooms so they can spread out and cool off. In winter, I close one room to force goats to group in a smaller space. Similar to the way baby chicks are grouped in a small box for safe shipping even in cold weather, goats grouped closely together create their own heat too. For most of the year, my goats use a litter box to pee in. Otherwise, I leave the wood floor in their barn litter free, so I can easily sweep up manure pellets. In cold weather, though, I transition my herd to deep bedding. I start with about 8 inches of straw on the floor in my goat comfort zone. Then, each day, when I come to milk the goats, I add another layer of straw over top of the urine and manure from the night before. About once a month, when the goats are out basking in the sun on our hill, I clean out the deep bedding and start over. Some people will leave the litter all through winter. But in my small space, if I don't start fresh once a month, the smell starts to bother me! Cleaning the barn cuts down on ammonia content from urine that can contribute to pneumonia in goats. Plus, it gives me more compost for the garden come spring. It doesn't get quite cold enough in our area to need to add heat to our goat barn for adult goats. However, when kidding season comes, it is sometimes necessary. Ceramic or garage heaters are a good choice for your “comfort zones” if you have electricity in your goat shelter. Propane heaters can also be a good option if you don't have electricity in your barn. 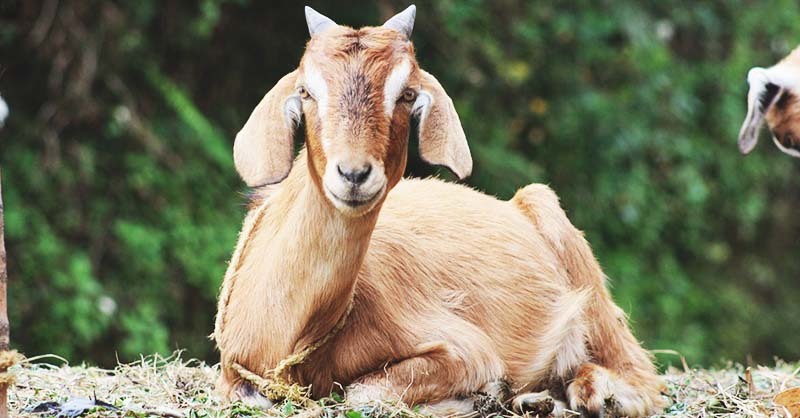 Regardless of what kind of heat source you use, keep in mind that goats are nibblers. For their safety (and yours) make sure they can't access cords or bump into heating devices. If possible, wall-mounting your heaters may make them safer for use with goats. Also, beware of fire hazards. Dry straw and hay are perfect kindling for an accidental barn fire. In winter, goats may need more water than in summer. They tend to spend a lot of time out in the sun to get warm which can be dehydrating. Drying winter winds also rob them of moisture. Additionally, eating dried hay and pelleted feed provides much less water content than eating live greens that contains water. I like to bring my goats a couple of buckets of warm water whenever I visit them during the day. The warm water encourages them to drink and gives them a reprieve from the cold. Also, they get so excited about the steaming water that it's like I am bringing them treats! Using dark colored buckets and setting them in the sun and out of the wind, can limit the likelihood that water will freeze during the day as well. 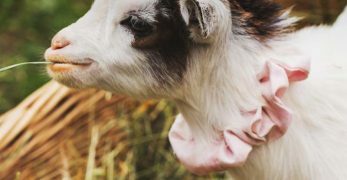 Not everyone has the luxury of delivering warm water to their goats as needed So, using a heating device to keep water from freezing may be necessary. 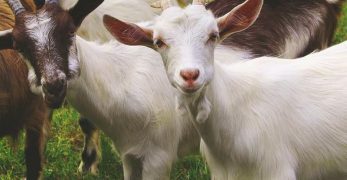 Similar to using a heater in a barn, you'll need to get smart to keep goats from chewing your power cords. Suspending a heated bucket on a wall to hold water at goat head height, then passing the cord behind the wall is one way to do this. Using a heated, water fountain stand and running cables under the floorboards is another option. Covering the cord with a protective casing that goats can not chew through, is another method to consider. 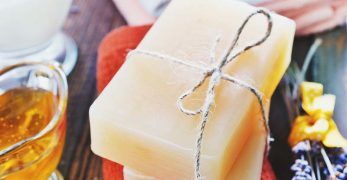 Besides these basic preparations, depending on where you live, you may need to secure some seasonal supplies early. All hay is not equal. 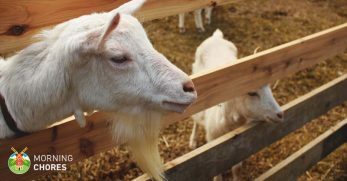 Goats need high-quality hay if that will be a primary feed source for them in winter. Putting a deposit on your hay for the winter, or picking up early, may be necessary if you live in an area where hay is in high demand and short supply. I share a hay order with some friends so we can buy in 50 bale increments to get prime quality hay at a lower price. If your hay needs aren't enough to command a good price, considering joining forces with other goat or horse keepers to increase your buying power. For some areas, straw bales are a seasonal commodity. Big box hardware stores may have it during grass planting seasons and for fall decorations. But if you need more than a few bales of straw, you may need to order from grain farmers, farm supply stores, or bulk landscaping materials suppliers. If you happen to get other bulk materials like mulch or compost, consider having your straw delivered with your garden materials. 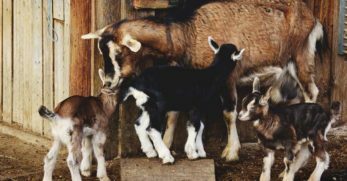 Your first line of defense in keeping goats comfortable in winter should be choosing breeds of goats that are well-suited to your climate. Then, making sure you've given your goats a shelter or barn that is sufficient to their needs and your weather conditions, is the next step. 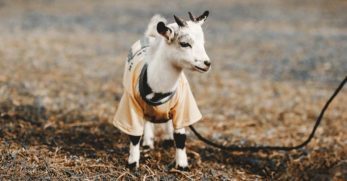 If you've gotten those two things right, then using these 12 tips to get your goats ready for winter, will likely go a long way toward helping your goats stay happy and healthy even in the cold weather. Also, keep in mind that unlike your goats, you don't have a natural fur coat to help warm you. 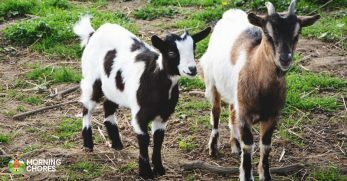 Gear up with good shoes, thick socks, and warm layers so you can also be comfortable when spending time with your goats! Sending you and your goats lots of warm wishes for those cold weather days!